Jollibee Peach Mango Sundae: a new twist to my favorite Peach Mango Pie! Why there's always room for dessert? For a sweet tooth like me, there's always plenty of room for desserts! Anything sweet will always have a special place in my tummy! Hahaha! One of my favorite desserts is peach mango pie from Jollibee. I can't count how many times I've eaten this simple but filling item from Jollibee. It's my default order when I don't know what to get when my son craves for Jollibee and I need to bring him there for his snack. Nothing is as comforting as the warm sweet filling of mangoes and peaches wrapped in the crispy crust of the Peach Mango Pie or the sweet creamy texture of the classic Vanilla Sundae – both Filipino favorites that have always been part of every langhap-sarap Jollibee experience. Since its introduction, the peach mango pie has always been the top choice for Filipinos when it comes to desserts. The Vanilla Sundae, also a favorite among Filipinos, especially kids, has been paired with hot chocolate fudge and strawberry syrup, among others. 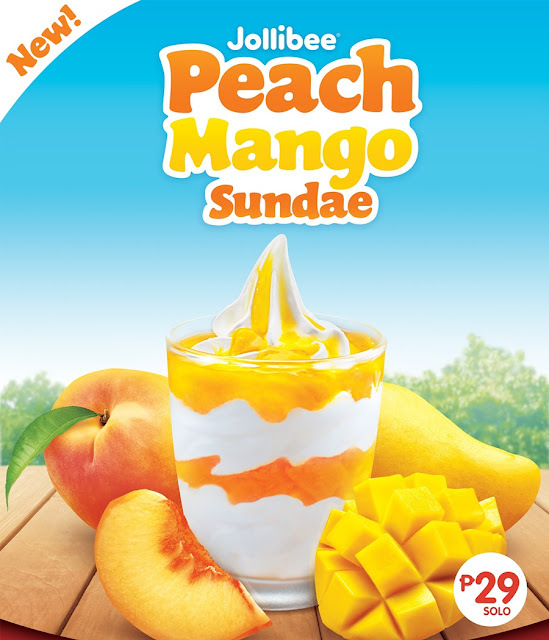 This time, Jollibee has decided to mix these two well-loved desserts, bringing a whole new flavor for everyone to experience – the Jollibee Peach Mango Sundae. The creamy texture of vanilla sundae topped with bits and pieces of peaches and mangoes brings out flavors that are both nostalgic and fresh. The Peach Mango Sundae is the ultimate dessert for Filipinos who can’t have enough of their sweet tooth fix with the peach mango filling and Jollibee’s classic sundae. It is best enjoyed with your favorite Jollibee meal. At only P29 each for ala carte and P20 as mini sundae add-on for value meals, the Peach Mango Sundae is now available at your favorite Jollibee store nationwide.